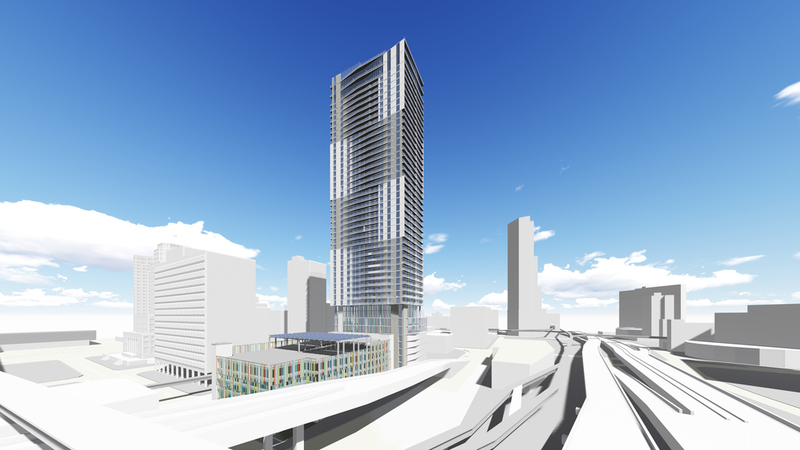 A residential tower that would rise above an existing parking garage in downtown Miami is being prepared for submission to Miami’s Planning Department for review. In 2013, the Miami Parking Authority board approved a deal with Downtown 56, LLC to redevelop the garage, located at 70 SW First St. The garage is known as the Cultural Center Garage, or Garage 2. It sits on a 28,910-square-foot lot, while Downtown 56 owns an adjacent property sized at about 17,000-square-feet. 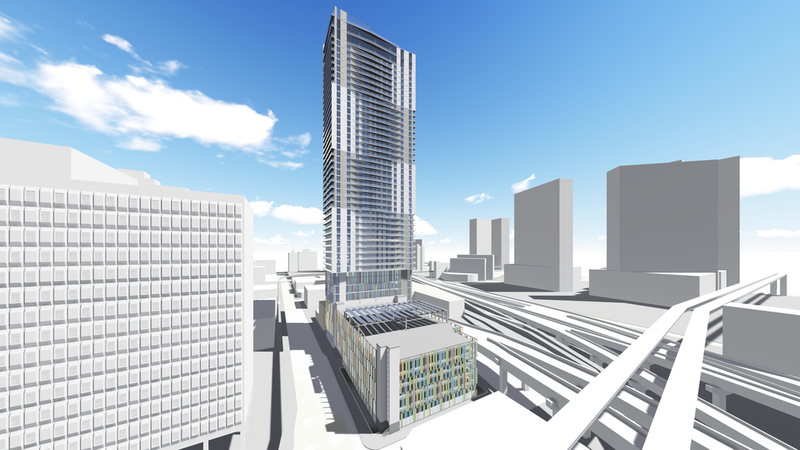 As part of the project, a 52-story tower with 432 rental units is planned for the empty lot. The garage is to be restored, refurbished, and brought up to code, while adding additional spaces and ground-floor retail. Submission to the city is expected within the next ‘couple of months’, an MPA official told TNM. Once approved, construction is expcted to take 36 months. Hope the same approach is taken with other city owned garages in the CBD!! Yes! More infill in the CBD. Architecturally, very well done. Clean lines and very appealing silhouette. Should be gracing Miami’s skyline right now. The best part is that another surface lot is going bye bye. Now on to the one west of the Miami Tower. Great to see more development like this in a neglected part of downtown Miami. Walking distance to metromover and metrorail a plus for this project. good to see the new trend is for rental buildings since the urban core condo market is completely saturated. In that location they cant sell at $600 a sft or fent for $3 a sft. U need thoae numbers to afdord a 52 story bldg…. These guys are just looking for someone to flip the site to.. Doubt they can sell for 600 a sft or rent for $3 a sft. Construction costs in a 52 story need those numbers…if not it doesnt work financially. Wont happen in this cycle. The majority of condos are owned by investors & rented out, so the most saturation is going to be of rentals. 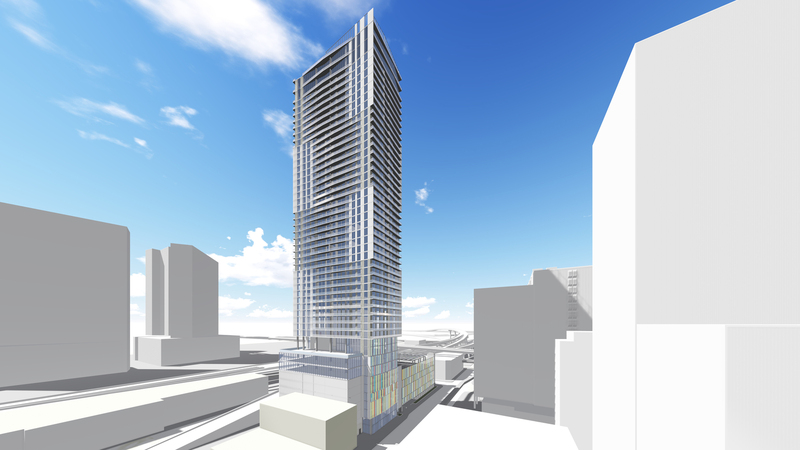 It looks like downtown is going to be over-built in both condos & rentals. It might take a few years to fill them & might lower prices when demand is lower than supply. I just noticed the solar panels on the roof of the parking garage. I’m happy to see some sustainability elements put in place. Brickell and the southern part of downtown is becoming an ENTIRELY NEW NEIGHBORHOOD with the new shopping center, more than 100 restaurants, 24-hour pharmacies, grocery stories, theaters, direct connection to the airport on the train. For instance, I would have never considered living in Brickell a year or two ago but I recently bought here and love that I only use my car about once a week…driving in Miami is a nightmare! I know there are many others like me and finding a couple thousand tenants in a metropolitan area of 5 million shouldn’t be too difficult for the handful of rental buildings currently under construction in this neighborhood so just relax with the negative speculation. How can you be absolute about something happening when you’re unsure of your own beliefs? I have to agree with the doubt. Construction prices have been steadily going up making it harder and harder to hit our numbers. We can only push rents in a model so far before we it just stops making sense. So for the people who bough land a while back at a great basis they can absorb some of this but I would expect going forward most of the new deals aren’t going to happen this cycle. The good news as that they’ll be ready to ramp up quickly once the tide turns again. Some projects will transpire and some won’t. That is a sign of a healthy balanced market. Waterfront sites are unlikely to be affected by this slowdown. This particular project will save a lot of money by not having to construct a garage though, which is one of the more expensive parts in building a high rise. This site right next to the highway ramp, yet only a couple metromover stops from Brickell may seem like the best of both worlds to many. I don’t see the point of voicing negative speculation to undermine consumer confidence, which ultimately hurts the economy and progression of this neighborhood…unless they are ‘anonymous’ competition. Two things to take into consideration before casting all this doubt. 1. Neighborhoods like Little Havana are pushing back and with the city commission deciding with this pesky Preservation Board, that can only push and benefit more construction toward highrises like this, especially in the CBD. 2. Some people are either not getting the message or are just ignoring recent reports about Miami being one of least affordable places to rent in. That can only mean the demand for rentals in Miami is higher than you think. Also, like BinBrickell said, this “is becoming an ENTIRELY NEW NEIGHBORHOOD.” This is not your mother and grandmother’s Downtown Miami, this is the new Downtown Miami everyone will want to be in in the next five years.